MYOB Advanced is a cloud based ERP software that allows you to manage financials and inventory. 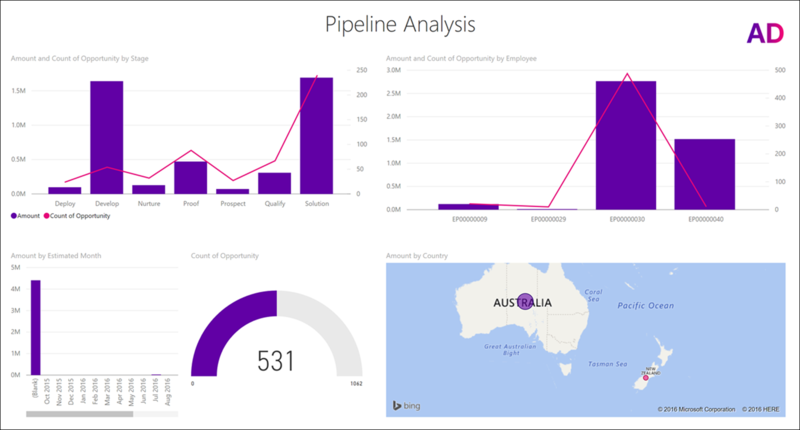 The Power BI content pack for MYOB Advanced turns on insightful sales reporting out-of-the-box. With limited expertise needed, managers and stakeholders can access a set of sales dashboards and reports and view KPIs, such as monitoring opportunity pipelines to see progress versus sales goals. It allows users to understand the volume of won and lost opportunities, and determine performance over time, such as month-over-month or year-over-year. To connect to the MYOB Advanced content pack, simply choose MYOB Advanced from the list of available content packs. You will be asked to provide your MYOB OData URL, which you can get from your MYOB Advanced account as well as your credentials. 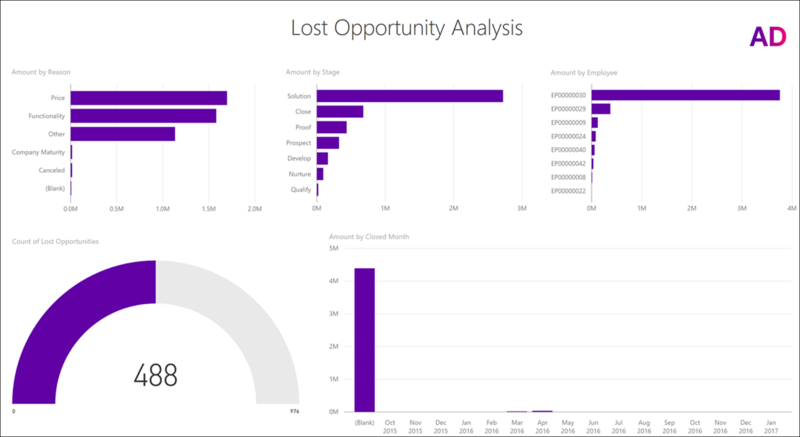 Once the connection is completed, Power BI will automatically create an out-of-the-box dashboard, report, and dataset with the data from your MYOB Advanced account. 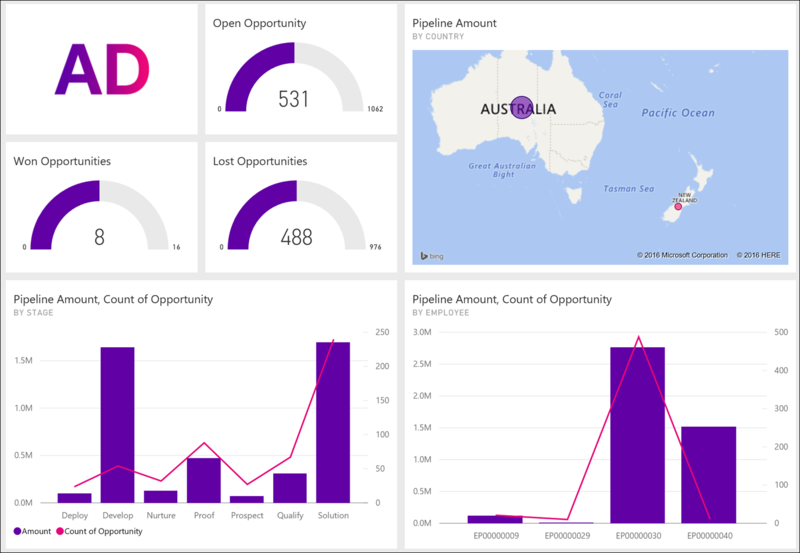 The dashboard for the MYOB Advanced content pack shows you key metrics about your opportunities, including how many were won or lost, as well your pipeline broken down by state, employee, and country. It also shows you a breakdown of your new opportunities by source and opportunity class. When you click on any of the visuals on the dashboard, you'll the related MYOB Advanced report with multiple pages that show you details on your pipeline and opportunities. It has pages for newly added opportunities, lost opportunities, won opportunities, and pipeline analysis. Power BI reports are fully interactive, so clicking on any data point will update the report to show you details about that particular selection. The reports created by the content pack are also fully customizable. You can simply click on Edit report and personalize it to show exactly the metrics most important to you. You can also create new reports and dashboard on top of your MYOB Advanced dataset to fully customize your experience. After the initial import, the dashboard and the reports continue to update daily so you are always seeing the most recent data. You can control the refresh schedule on the dataset, and configure to refresh at the exact times you choose.